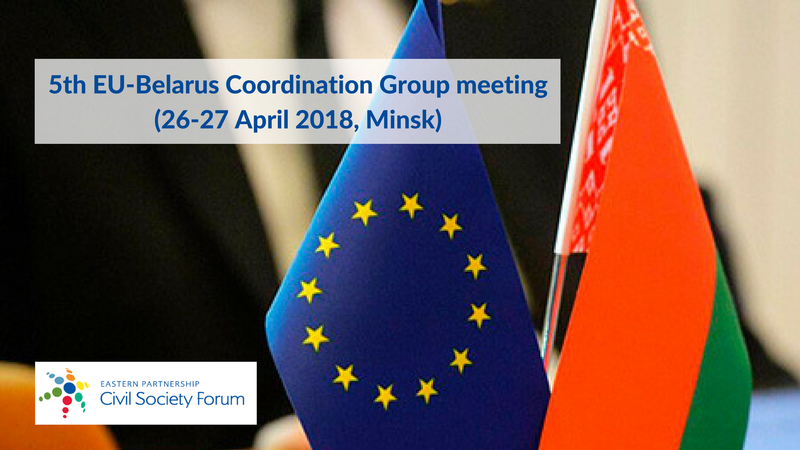 On April 26-27, the 5th meeting of the EU-Belarus Coordination Group in Minsk gathered participants from Belarusian CSOs, the European External Action Service (EEAS), the European Commission, and high-level officials from the Belarusian Government and the Ministry of Foreign Affairs. The Belarusian National Platform of the Eastern Partnership Civil Society Forum was represented by Ulad Vialichka, Director of the International Consortium EuroBelarus; Irina Sukhiy, from the NGO Ecohome; Andrei Yahorau, Director of the Centre for European Transformation; Christina Richter, Director of Youth Labor Rights (YLaR); and Aleg Hulak, from the Belarusian Helsinki Committee (BHC). The Forum representatives brought to the dialogue their position on a number of issues of the EU-Belarus relations. They focused on energetic efficiency, security and diversification; measures to boost entrepreneurship; and the Bologna Process and the inclusion of Belarus in the European Higher Education Area. What did the participants of the Belarusian National Platform suggest? Irina Sukhiy said that the German Aerospace Agency, on the request of Belarusian environmental organizations, developed a scenario of Belarus’ transition to 100% renewable energy sources by 2050. According to Irina, “this is a serious work of 600 engineers who calculated the scenario on the basis of Belarusian data. We would like to discuss this scenario with the Ministry of Energy”. Andrei Yahorau: “Such scenarios were created for almost 40 countries and were highly appreciated by intergovernmental groups of climate experts. Countries that seek to reduce emissions into the atmosphere are actively using these scenarios. This is a scientific analysis that suggests other approaches to the development of energy in our country. Now we have such a strategy for Belarus, which should be discussed with a number of state and public partners”. Ulad Vialichka: “One of the important steps towards improving the climate for entrepreneurship in our country was the recent Decree No. 7″ On the Development of Entrepreneurship”. The Decree is assessed by the business associations and the business community as an important step in the right direction, but the tools for its implementation are imperfect, they need to be improved. In particular, the Decree provides creation of numerous public advisory councils at the regional level for state-public dialogue on this issue. But the practice of such councils is still weak and imperfect, there is not enough preparation, capacity of both sides to talk with an orientation toward certain changes and results. In this, the Belarusian business associations and public organizations are ready to help, so that the tool of advisory councils really becomes result-oriented. Also, Belarusian business associations express their intention to make an analysis of the extent to which the normative acts that have been adopted in recent months are really working to improve the business environment, they are ready to share their findings with relevant state actors”. Christina Richter: “The Belarusian side notes the growing mobility of teachers and students. This is indeed a certain positive, which brought the Bologna process. At the meetings, the issue of mandatory work placement was touched upon, this mechanism by itself is not very clear for the EU representatives”. Either Belarus will be included in the group of countries that have problems with the implementation of the requirements of the Bologna Process. The Belarusian side insists on this. This step significantly reduces the ambitions in the field of education reform. Another alternative: Belarus will remain in the status of a “special case” and will continue to implement the “roadmap” of reforms in the next period. The European side is inclined towards this option. The most negative scenario may be the exclusion of Belarus from the Bologna process. But this is unlikely, since such a procedure does not actually exist. They also discussed other topics such as trade and transport, the developments of EU-Belarus relations under the framework of the Eastern Partnership, and the main Partnership Priorities. The next round of negotiations of the EU-Belarus Coordination Group will be held in autumn 2018.